The Prosperity Economics Movement is a wholesome and positive remedy to the limitations, guesses, and fear-based typical financial planning. Whether or not you’ve ever considered your way of thinking about money, you owe it to yourself to pause for a moment of reflection. Have you fostered your awareness of what you are allowing to influence your financial beliefs and perspectives? We aim to help you develop clarity on your financial foundations and philosophy. If your current mindset is not helping you create your ideal life, we give you the permission to think differently. 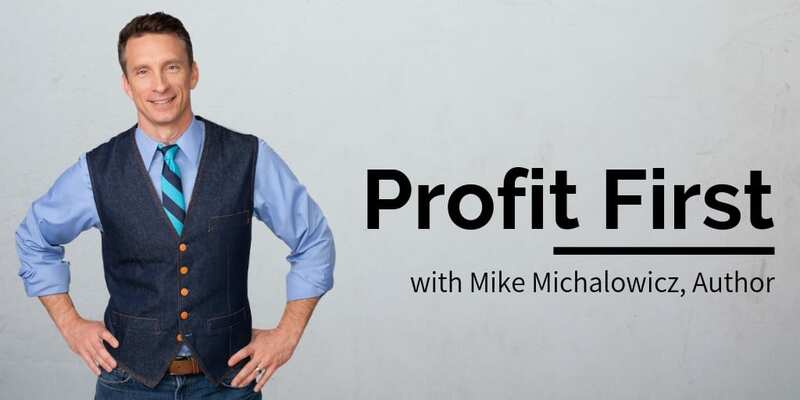 This article, in conjunction with Part 1, provides the basis for understanding the principles and beliefs guiding the typical money conversation and those behind the prosperity conversation. In today’s article, we’ll highlight the last four of the twelve differentiators. With the typical financial conversation, the ambition is to build a nest egg large enough to live on interest in retirement without depleting the principal. You used to be able to withdraw 5%, and the growth of your account would keep up with that, so you didn’t shrink your nest egg. In today’s environment, the going distribution rate is about 2.8%. That means that if you take distributions higher than 2.8%, you’re likely to be taking out more than your account growth and shrinking your nest egg. The remedy would be to either accumulate a nest egg double in size or feel comfortable living on half the income during retirement. Because many of the assumptions beneath the financial equations are outside your control, you may end up with a plan that gives you, say, a 93% chance of still having money left at age 86. What if you lived longer? Most people I know would rather have a 100% chance of success that gives them the confidence that their long life won’t become a liability. 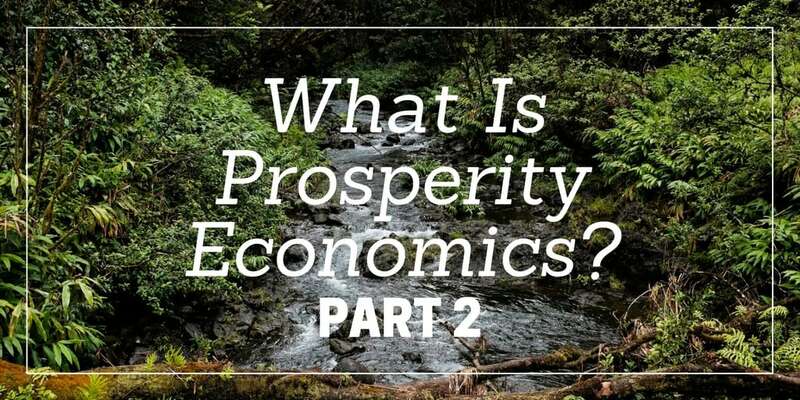 Prosperity Economics endeavors to build a flexible and sustainable financial system that allows you to spend and replace principal. It’s no virtue to be comfortable with uncertainty, especially in our financial lives. If we’re honest, we’d all rather have a system that you know is going to work. That certainty allows you to enjoy your life today and in the future. When you have confidence for the future, you’re not going to get there and then be fearful of spending because you’re afraid of depleting your cash. After all, what’s the point of “retiring” if you can’t enjoy it? Imagine a water reservoir with no outlet, where the water sits stagnant. This describes the Dead Sea. The Dead Sea has one main tributary, the Jordan River. However, once the water reaches the Dead Sea, it stops. There’s no outlet. After water enters the Dead Sea, it sits stagnant. It collects all the salt and minerals from the inflowing streams and then concentrates as the sun bakes off the water. Because of the Dead Sea’s hypersalinity, nothing grows in, on, or near it. And if you go for a swim, you cannot sink. On the other hand, the Mississippi River flows from many smaller streams into the Gulf of Mexico. At every point, the water continues. It is a flowing entity; water moves through it. As a result, the Mississippi River is teeming with life. Schools of fish abound, and lush foliage and trees flourish on the banks. Our money is like water. When it flows to an account, but there’s no outlet, it becomes stagnant. Typical financial planning has an objective to get money into accounts, hold it there as long as possible, and not have you access or use it for anything else. But when you cut off the supply of your money through your entire personal economy, you restrict your ability to create a flourishing financial life. Money is meant to flow through assets, like the Mississippi River, in and out, like breathing. 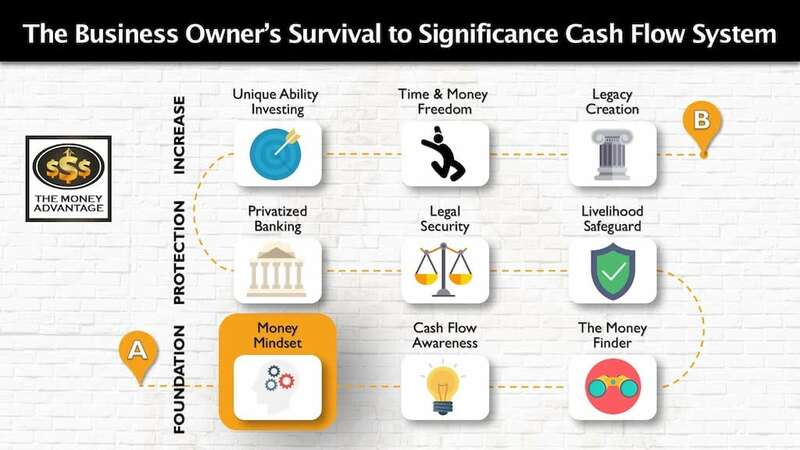 Into your hands, through checking, through savings, through assets like businesses and property, out as cash flow. Only a value system that recognizes this role of money will celebrate using it, rather than just accumulating it. In fact, the water cycle itself, from rainfall to evaporation to cloud formation, and back to rainfall illustrates this self-perpetuating cycle. And only a financial system that continually pumps money through the entire system will create a life that’s flourishing in every area, not just one part. Typical financial planning earmarks each of your dollars for one job. It restricts the use of your resources to just one thing, i.e., retirement, college funding, emergencies, personal spending, or a vacation fund. Whenever you designate money to a particular account that isn’t intended to be used for anything else, you stop the flow. Shutting down to flow of money through assets limits the good it can do in your whole personal economy. It helps you view your personal economy holistically, not a compartmentalized system with each part disconnected from the rest. Instead of one dollar being used only for college planning, it values creative solutions where the dollar can multitask. For instance, it can provide insurance protection while also giving you a place to store cash, while also giving you a pool of tax-free capital you can borrow against, and allow you to invest the same dollar into a cash-flowing investment property that pays for your child’s college tuition. 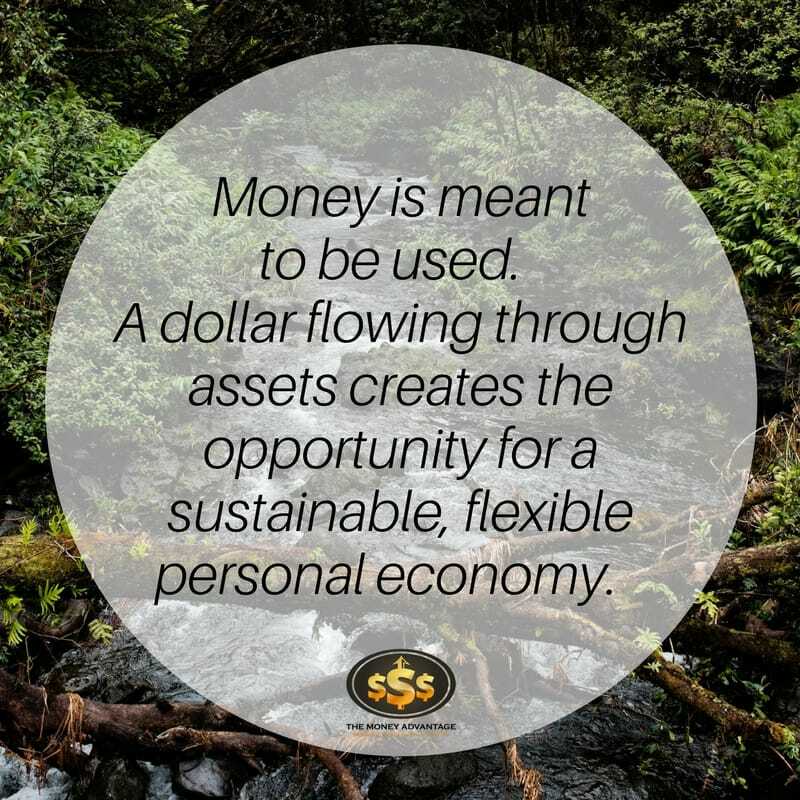 The ideal position is to have a financial system that perpetually moves money through it, rather than thinking of your financial life like a transaction with one starting point and one stopping point. The more times you recycle your money in your own personal economy, the more use you can get from the same dollars. It’s called velocity of money. It’s what banks, the government, and financial institutions do to maximize the use of every dollar. You can employ the same concept in your own economy. In the typical planning model, planning is delegated to a professional. Money, investing, and financial planning are seen as complicated, complex, and requiring an above average IQ to master. So, we give up control to someone we believe is more capable and qualified than we are to chart our own financial future. Instead, Prosperity Economics celebrates the power of simplicity. It empowers you with an education-based approach that builds financial confidence. Prosperity Economics values you as the center of your own universe. There is no one more qualified to be in control of your life than you. Nobody else can ensure they arrive at your intended destination. No one else can live your life and create the meaning and sense of fulfillment that you crave. We want to help you enjoy your understanding of money. When you recognize that the real value transaction that creates the money in the first place is providing real value for real people, you look for ways to use your skill set to be of more value to others. When you walk in prosperity and abundance, you’ll be able to create more value for others, and this will translate to more cash flow. Prosperity Economics gifts you the ability to change your mindset and remove the limitations in your financial life. If you’d like to take a fresh approach to your finances, now is the ideal time to make your next move. When you’re clear-minded about what you want, decide to take that one action step to launch you from your current reality into a new reality.